Do you need to remove the old antifouling from your boat? Its hull is not smooth with small flakes of old paint that are gone? 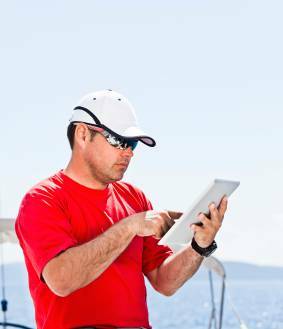 Does your boat see its speed reduced and its fuel consumption increased? We are a company specializing in boat maintenance on the French Riviera, we do dozens of hull cleaning and antifouling painting every year. Sandblasting, in our case the dustless sandblasting of your boat is necessary every 5 years at least unless you have chosen a self polishing antifouling from the start. Indeed it is the hard type of antifouling that remain and whose layers accumulate over the years. Unlike hard type antifoulings, self polishing antifouling (the one we use for our clients) see their thickness decrease very slowly while sailing, with the remainder being removed at high pressure cleaning at the shipyard. Sandblastinging your boat may be the opportunity to start a new cycle with our long lasting silicone antifouling. When sandblasting with traditional method, sand and old paint eventually end up in the water of the port or in the air after drying (despite the covering of the boat). On the other hand, our dustfree method, with aspiration is ecological, in fact the paint chips are sucked up, recovered and then deposited and returned to a controled facility in town. TIP : Be careful when you plan to sandblast your boat, make sure you select a company specialized in boating, indeed the processes are different from the construction industry. We attended several times (as a neighbor) on shipyards where a building company intervened and the hull of the boat was TOTALLY damaged. Do not hesitate to get in touch with us for any questions and to tell us about your boat sanding project on the French Riviera by filling out the form below or on the contact page.